Everyone loves sea otters – not to would be ‘otter’ nonsense! But how much do you know about them? 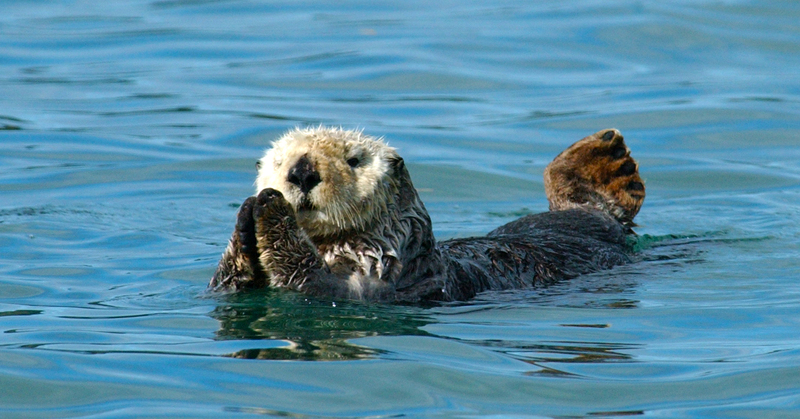 The last week of September is ‘otterwise’ known as Sea Otter Awareness Week, offering a perfect chance to learn more! Dr Sylvia Parsons*, a Research Associate at the Centre for Marine Science and Technology (CMST) at Curtin University, shares some ‘otterly’ amazing facts about these marine mammals. Sea otters, Enhyra lutris, belong to the family of mustelids that also includes weasels and badgers, amongst other carnivores. 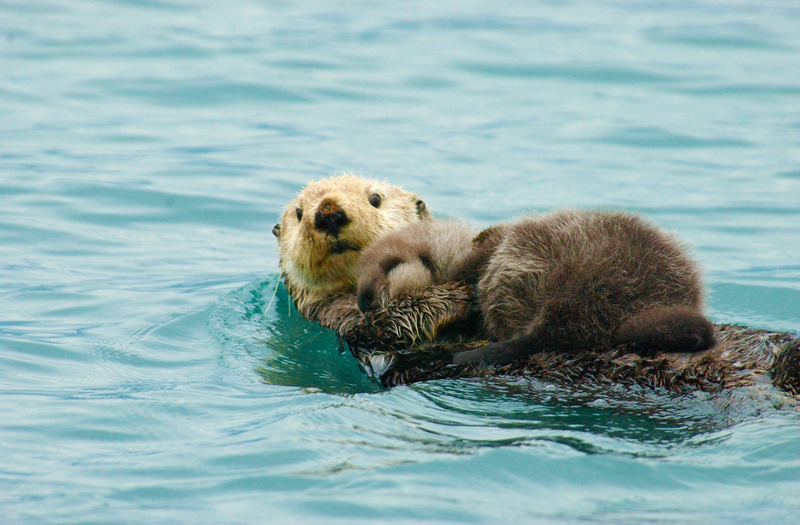 There are three subspecies of sea otters inhabiting different coastal areas of the Pacific Ocean, i.e. along the Russian coast including islands in the Bering Sea, along the south-western to southern coast of Alaska and off California. Some areas are now inhabited by the descendants of previously translocated individuals. With the densest fur known in the animal kingdom (approximately 100,000 hair/cm2, ranging from about 26,000 to 165,000 cm²), sea otters were hunted for their fur to near extinction, until the early 1900s. This targeting decreased their original range and limited their genetic diversity, before management efforts in the 1980s began their recovery. Despite these efforts, sea otters are currently listed as Endangered on the IUCN Red List of Threatened Species as some populations have been declining due to impacts of environmental and anthropogenic events, such as oil spills, disease and predation. Sea otters are considered a keystone species as they play an important role in the structuring of their ecosystem, removing them would alter their surroundings immensely. Some populations mainly feed on sea urchins which graze on macroalgae like kelp. 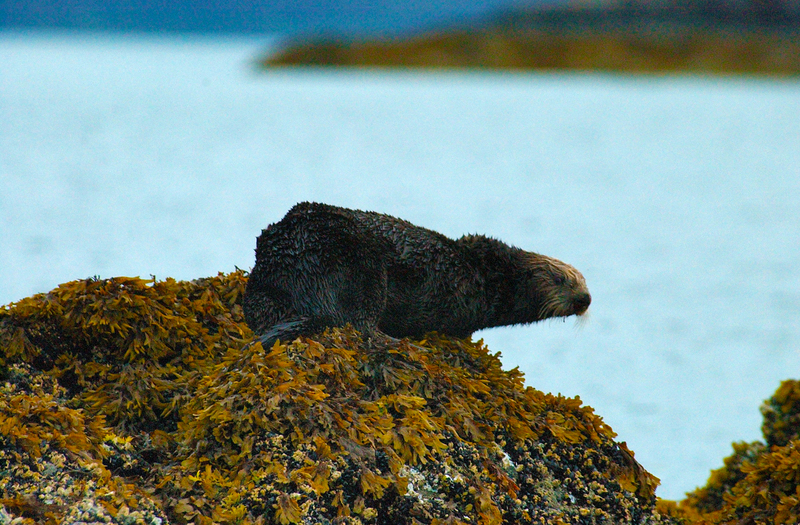 As a result, removing sea otters from such areas increases the number of grazing sea urchins in shallow waters, which then limits macroalgae growth or eliminates it completely and with this, reduces fish life nearshore, including fish nursery areas. Although capable of hauling out (i.e. spending time on land), they do not appear to do so very often and are actually quite awkward and clumsy on land, so sea otters spend most of their time in water. Unlike other marine mammals born at sea, newborn sea otters are not capable of swimming or diving and only acquire these skills slowly from about three-four and six-ten weeks of age, respectively. Newborn sea otters are in fact not even able to duck dive due to their dense fur coat which is groomed and aerated for extra insulation by their mothers. Much like human children, sea otter pups often seem to dislike being groomed, squirming and complaining frequently. Newborn pups will typically float on their backs at the surface or lie on their mother’s chest. Once a pup gets older, it will slowly start to find and retrieve some of its own food. However, its foraging success will still, for quite a while in fact, be considerably lower than that of adult sea otters. Therefore, it will try to ‘steal’ food from its mother if she does not immediately share it after surfacing from a foraging dive. On several occasions we observed mothers swimming away from their pup to be able to have a bite, before ‘losing’ it to their pups. 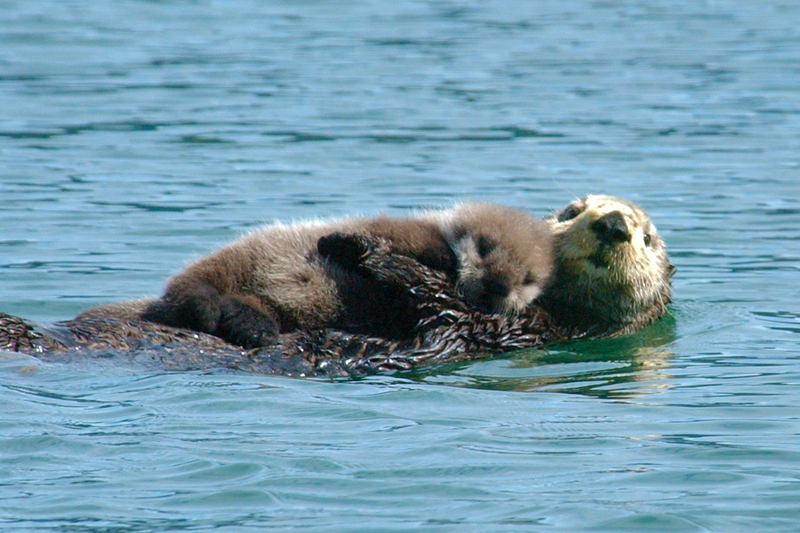 Because sea otters are one of the smallest of the marine mammals, their surface-to-volume ratio is consequently higher. Although their fur coat provides good insulation, it is not sufficient to offset heat loss to the marine environment and to add to the cold, sea otters are thought to not store fat like other marine mammals. To counter this, sea otters have a resting metabolic rate that is about 2.4 times higher than a terrestrial mammal of the same body mass. To offset this they consume roughly 20-30% of their body weight in prey, daily. 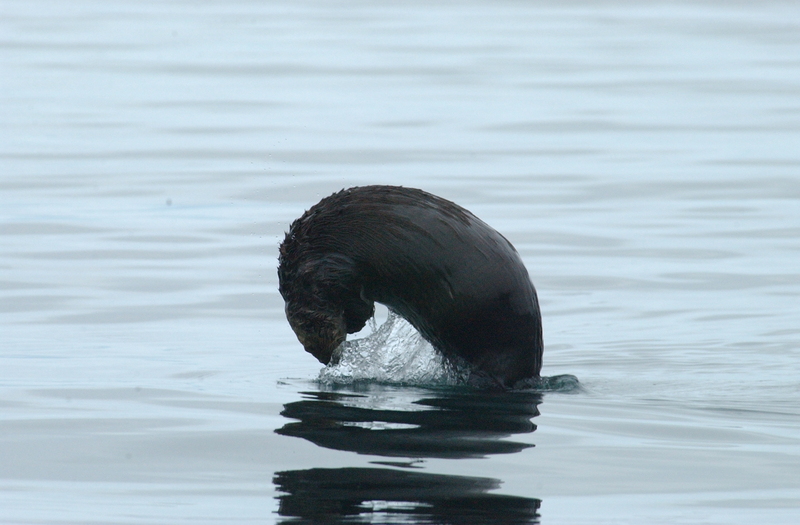 Sea otters usually select multiple prey items on a feeding dive which they store in loose skin flaps close to their armpits, before feasting at the surface while floating on their backs. Sea otters are commonly known for their tool use to crush e. g. sea urchins or clams with the aid of stones. However, tool use is not prevalent in all populations. In fact, sea otters in Simpson Bay, in Prince William Sound, Alaska for example, have not been observed to use stones to access their food, which mainly consists of clams (75%), mussels (9%) and crabs (6%) and even catch octopus (see picture above!) and occasionally sea stars or sea cucumber. Once populations have become established they may develop a greater variety of prey items, though if there is an abundance of something nice, they can be creatures of habit. Sea otters in Simpson Bay, for example, have lived mostly on bivalves for over two decades, with most individuals in the Bay migrating there for the summer each year. Sea otters are not known to be migratory, however, the numbers of sea otters in Simpson Bay are considerably lower during winter, compared with the summer months. It is currently unknown where these animals spend their winter. Unlike other marine mammals, like dolphins or sea lion, sea otters are mostly solitary and rarely socialise, especially when grown-up, yet they can be seen resting together, and may even float in rafts, sometimes in large groups. Pups, however, can be quite cheeky, playing together while their mothers hunt and gather prey. One of our most interesting, though very brief encounters, was ‘meeting’ an older, very curious pup which seemed to have an urge to touch our dinghy, while being closely escorted by its very protective and caring mother. It was a delight to observe and experience sea otters in a quite remote and pristine area for some time, and I hope to be able to return some day. Cortez et al. 2016. 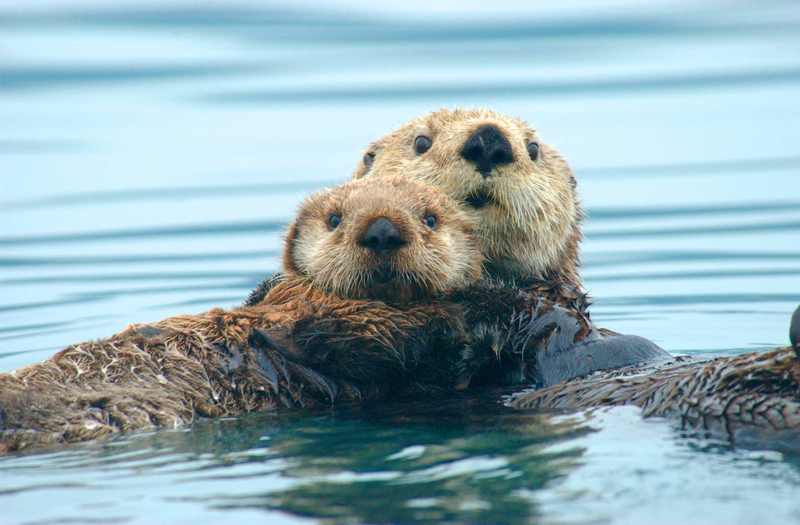 Development of an altricial mammal at sea: Activity budgets of female sea otters and their pups in Simpson Bay, Alaska. Journal of Experimental Marine Biology and Ecology, 481: 71-80. Osterrieder, S.K. * and Davis, R.W. 2011. Sea otter female and pup activity budgets, Prince William Sound, Alaska. Journal of the Marine Biological Association of the United Kingdom, 91(4): 883-892. Osterrieder, S.K. * and Davis, R.W. 2009. 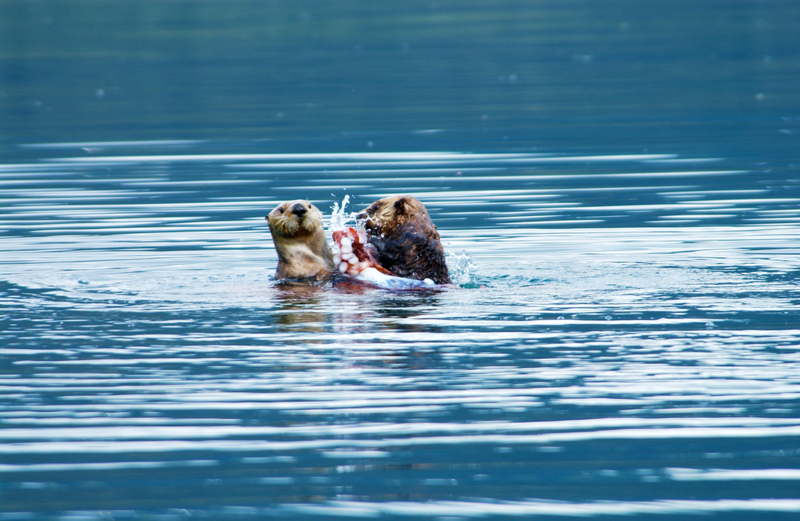 Summer foraging behaviour of female sea otters (Enhydra lutris) with pups in Simpson Bay, Alaska. Aquatic Mammals, 35(4): 481.